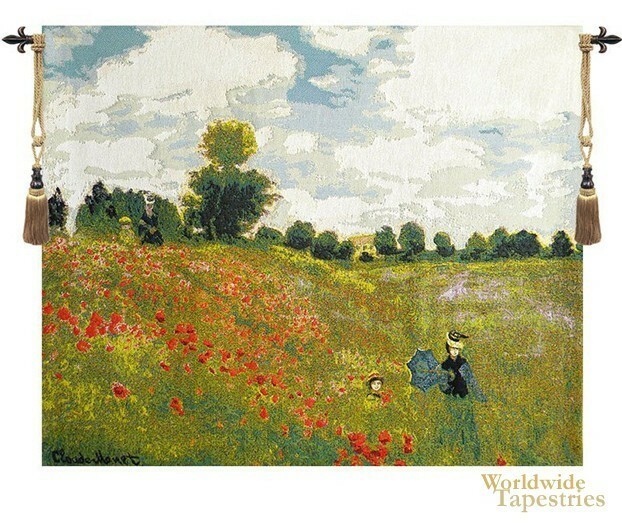 Monet's Poppies tapestry shows the red poppy fields from Monet's painting from 1873. With a love of natural environments, we see one of Monet's many representations of poppy fields. Here we see a lady with a parasol, and a child, enjoying the sunny day in the countryside filled with blooming poppies. This is a scene celebrating both summer and the abundance of poppies which provide much beauty in the wild countryside. The manor is seen in the distance. This Poppies Blooming - Monet tapestry is backed with lining and tunnel for easy hanging. Note: tapestry rod and tassels, where pictured, are not included in the price. Dimensions: W 24" x H 19"
Dimensions: W 34" x H 27"
Dimensions: W 55" x H 35"